As we age, our bodies change and adapt throughout the years. While elderly Californians have plenty to worry about in order to obtain optimal health, their oral health is often left to the wayside. As a top provider of general dentistry to Concord residents, our local dentists are here to give all of our patients the knowledge and services needed to smile and thrive. Concord Smile’s goal is in the name; from dental exams to tooth extractions and root canals, our family dentists are here to help with every aspect of your oral health. If you happen to be an elderly patient, the general dentistry services we provide will definitely be more intensive. 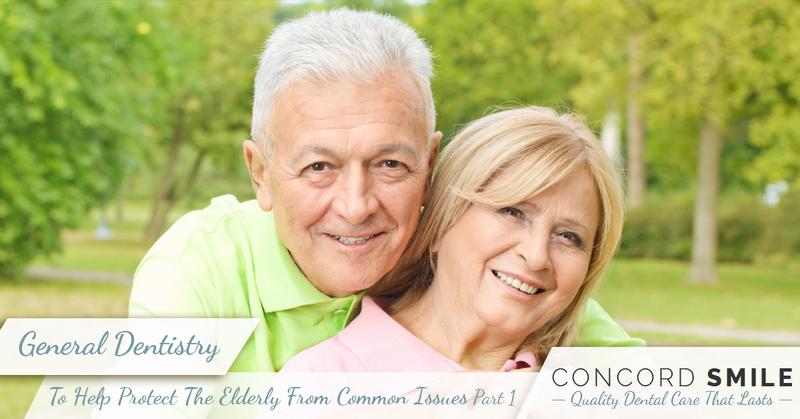 Today, we’ll look at a few common oral health issues that senior citizens face. No matter what your health needs are, our oral experts are here to treat you every step of the way! This common problem, according to the Oral Cancer Foundation, affects roughly 20-percent of the population. Also known as xerostomia, dry mouth is exactly what it sounds like – a greatly reduced flow of saliva that creates a very dry environment. Unfortunately, saliva is vital for protecting tooth enamel while preventing gum disease and tooth decay. The top culprit behind the prevalence of this issue is actually other medications, where the side effects of multiple medicines can include dry mouth. If left untreated, the results for the elderly can be destructive and uncomfortable. Concord Smile recommends keeping well hydrated and avoiding diuretics such as caffeine. If your dry mouth becomes a continual problem, we can discuss medications with your doctor in order to find a healthy compromise. Over time, oral health issues can add up. For seniors who are in need of oral treatment, these problems can manifest as cavities, infections, cracked or missing teeth, gum disease, and everything in between. When this happens, the simple task of ingesting food can become very troublesome. Seniors who cannot obtain dental assistance often suffer from malnutrition, which can be a high health concern for people of all ages. When your smile is overwhelmed by unhealthy plaque buildup, the result is often inflamed, infected gums. Senior residents who have not been consistent in their oral health practices often suffer from decades of neglect, where Gingivitis and plaque can foster a very unhealthy environment for your gums and teeth. When you couple these concerns in with elderly patients’ immune systems, the results can be very unwelcome. Fortunately, Concord Smile can offer intensive gum treatments to clear out the bad lifeforms living along your gum line and work to restore the overall health of your smile. Elderly patients are faced with a higher amount of risks and concerns in the grand scheme of oral health. However, our professional general dentistry gives Concord residents a reason to smile. Under strong leadership with years of experience, our trained experts are here to create an oral care plan that will restore your oral health. Next time, we’ll look at a few more issues that senior citizens have to worry about in order to maintain their healthy smiles. If you are in need of a dental exam or some other service, feel free to contact us today to schedule an appointment!